The Chou Dynasty, which reigned in China from 1122 to 221 B.C. , was particularly known for its superior bell founding. European bell founding occurred much later and originated in medieval monasteries. The first European bells resembled cow bells: iron plates that had been hammered square and then riveted together. By the 15th century, founders began to experiment with bell shape and tone. Secular bellmakers gained prestige in the Renaissance with the flourishing of Gothic architecture which featured grand bell towers. 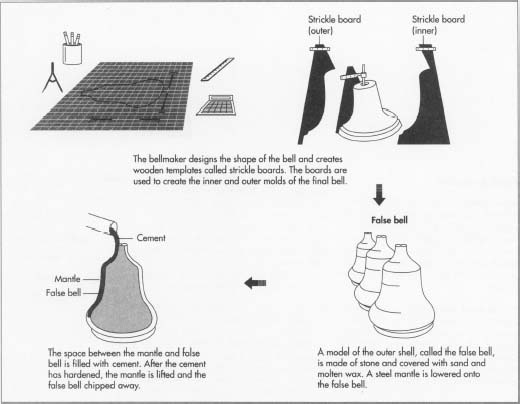 The craft of casting bells has remained essentially the same since the 12th century. The one singular innovation was the invention of the tuning machine in the 19th century. Prior to that time, the proper tone was achieved by chipping the sides of the bell with a hammer and chisel. This procedure carried a high risk of damaging the bell. The tuning machine, which is essentially a vertical lathe, has reduced that risk. Electronic tuning machines have increased the bell founder's ability to test the accuracy of the bell's tone. 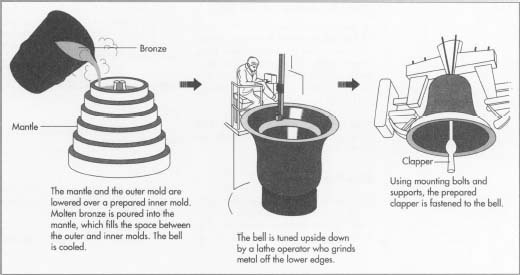 All in all, however, creating a bell is still very much a hands-on process. painted over with three coats of very fine, fireproof clay. It is then enclosed in a steel mantle that has been lowered by rope pulleys. Ingots of bronze are melted in oil burners and heated to a temperature of approximately 1150Â°F (1100Â°C). P.S. Why doesn't your mailer like the name of that other copper alloy?